“Speech” refers to saying a variety of sounds clearly while “language” refers to expressing oneself with words and gestures, and understanding words and sentences. A speech and/or language delay occurs when a child doesn’t meet the typical developmental milestones for their age (see below for milestones). What causes a speech and language delay? Most speech and language delays have unknown causes. There are some factors that contribute to early speech and language difficulties (e.g., family history, premature birth, low birth weight, intellectual disabilities, cerebral palsy, Down syndrome, hearing loss, etc. ), but many times, no obvious cause can be determined. 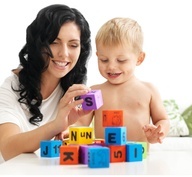 How can a Speech-Language Pathologist (SLP) help? SLPs have training to thoroughly assess and treat your child’s verbal expression (i.e., vocabulary and early grammar use), understanding of language, and speech sound inventory (i.e., the specific sounds that your child is and is not producing). Is there anything I can try myself? What speech and language skills should you expect?